Rack shelf to hold up to 8 DIRECTV H25 satellite receivers in a standard 19 inch equipment rack. Top Shelf is 6.5 Inches deep, Bottom Shelf is an extended 12.5 Inches deep to hold H25 power supplies. Holds receivers up to 1 3/16 Inches with 7/8 Inch spacing between receivers. 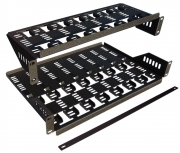 Rack shelf to hold up to 10 CT-HDIPSS or 10 CT-HDIPCOM in a 19 inch wide equipment rack. Shelf includes 1 top, 1 bottom, 1 cross bar and 10 protection pads. Pairs with CT-HDIP-PS10 power supply (sold separately).